HoRNet CLMS is designed to solve the “loudness deception” issue allowing for a constant loudness mixing experience. As is widely known the human ear perceive each frequency differently at different loudness levels, this effect may lead to misjudgement while taking decision in mastering and mixing. When using any effect like an equaliser or a compressor the level of the affected signal may change significantly and this variance may let you take wrong mixing decisions. HoRNet CLMS takes the loudness factor out of the equation simply keeping the loudness level constant during monitoring. 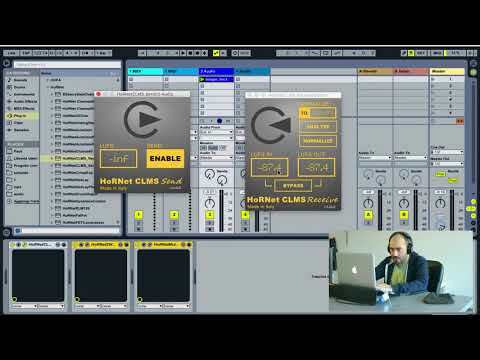 CLMS is based around the concept of LU (Loudness Units) and it’s actually two different plugins, one is called HoRNetCLMS_Send (used to “read” the LU level of the track before processing) and the other one, called HoRNetCLMS_Receive that is usually set as the las plugin of the master chain and has the duty to apply the necessary gain to keep everything at the sender’s level. CLMS inner working is quite easy, the HoRNetCLMS_Send reads the LU level of the track and stores it in a common memory area, then HoRNetCLMS_Receive reads that area, compute the differences between its input LU level and the one recorded by HoRNetCLMS_Send, and applies the necessary gain to keep the output level at the same LU amount of the one recorded by HoRNetCLMS_Send. You can put as many HoRNetCLMS_Send as your mixing or mastering session needs, the plugin provides a button that “enables” the communication between the sender and the receiver, this channel is mutually exclusive, only one sender can talk to the receiver at time. On the HoRNetCLMS_Receive we have also put a cool LUFS normalisation utility, you can choose the target level for normalisation clicking on its text box, then click the “analyze” button to let the plugin record the average LU level of the the track, once finished, enable the “normalize” button and let it change the gain to make the track as loud as you want. Please create a detailed instruction manual. We don't want to refer to a video, especially when we need to scan through and double check/refresh our memories on something. Reading is faster than videos. Finally, I recommend this plugin as a temporary tool. I do not recommend leaving this always on. It is fast, but I don't think any plugin can be fast enough to compensate for big changes; it has threatened my speakers a couple times adapting between parts that have big dynamic differences. I put this on when I have cycle on and I'm really zeroed in on a part or track, and I turn it off when I'm done. In this way, this plugin is spectacular and a must have. A very useful utility for working in lufs. If you have a daw that doesn't work in lufs this is a very easy way to add lufs monitor and gain. It makes it very easy to normalize to lufs along with the ability to learn lufs for multiple tracks at the same time, while you go do something else like walk your dog. The read plugin is useful for effect chains that don't "chop" audio (like a trance gate) or time shift like a delay. Instead, I'm using it to wrap my eq/compression to keep the lufs constant despite how I alter my my freq content. Eliminates a lot of a/b switching. Overall it is saving me days in my creative mix. This is a fantastic tool, and much more affordable (and simpler) than a comparable tool from Ian Shepherd and Meter Plugs. IMO this should be in every producer's kit to help you hear what an insert device(s) (or an entire rack) is really doing to the original sound, instead of being fooled by the "louder is always better" problem. It's not hard to use, people! Just put the CLMS Send plug in front of the device(s)/rack(s) you want to loudness normalize. Then put the CLMS Receive plug after the device(s)/rack(s) you want to normalize. Then click "Enable" on the CLMS Send plug to make the loudness coming out of the CLMS Receive plug match the loudness going into the CLMS Send plug. Wonderful and effective tool, works perfectly in my setup in Reaper, and is simple and straightforward to use. After reading about another developer's loudness compensation plugin, which I found to be absurdly overpriced, I was extremely happy to discover CLMS. That loudness sounds "better" to us seems to be an intrinsic psychoacoustic fact, and being awareness of this bias does me no good. But CLMS solves the problem. Thanks Saverio! I get a pumping effect if I put receiver on master so i just put on relevant aux buss to monitor the send to that for improvement s from other plugins- is that a legitimate solution? Quando verrà rilasciato un update?